"Women artists are the focus of Todd Merrill Studio’s booth, and among the pieces is a new work by Beth Katleman. 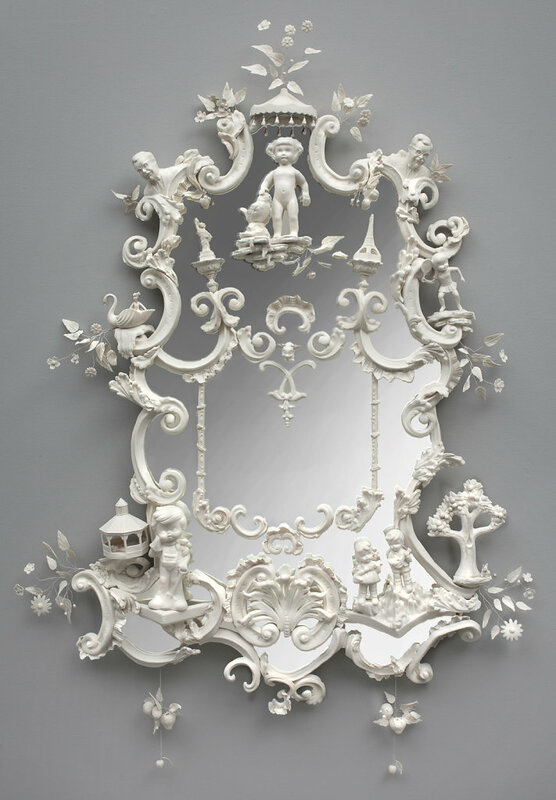 Called White Rabbit, it is a Lewis Carroll riff on a rococo Thomas Chippendale girandole. The humorous piece, measuring 77 inches high by 31 inches wide, is peopled with cartoonlike characters, including a pigtailed girl in a hoopskirt (quite plainly standing in for the heroine of Alice in Wonderland), the Cheshire cat, and a rodent wearing a top hat." In the world of contemporary design, there are few fairs more universally heralded than Design Miami/Basel. The counterpart to the Art Basel fairs in Miami, Florida each December and in Basel, Switzerland each June, Design Miami/ has served as one of the preeminent venues for collecting, exhibiting, and discussing highly collectible contemporary design for 12 years now, offering a glimpse into not just the future of style, but the ways in which we think about creativity in design as both producers and consumers. His look is not that of your customary starchitect; he stages incredible operas with his wife in his New York townhouse, he has a penchant for both classic motorcycles and classic bronzes and he has pretty much single-handedly redefined the look and feel of luxury retailing in recent years. 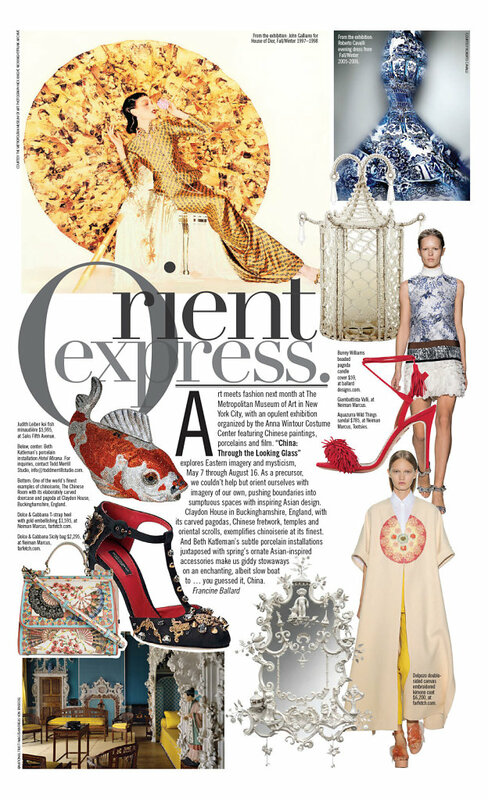 Right now fashion is speeding. So much so that even the industry is having trouble keeping up with who’s showing what season, when and where. Designers are coming and going at a similarly frightening pace, only eclipsed by the consumer’s insatiable appetite for the next and new. So what’s left to hold a brand’s ethos steadfast? Their increasingly majestic stores charged with upholding house DNA no matter the season or the creative director in the driver’s seat. 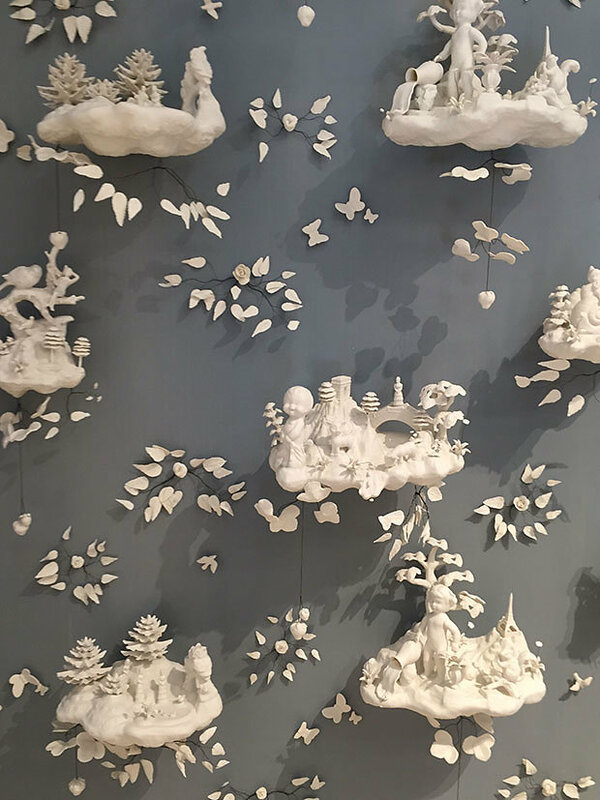 "Another highlight is Beth Katleman’s porcelain installation “Hostile Nature” at Todd Merrill, a low relief wall piece inspired by an 18th-century print room wallpaper from the Victoria and Albert Museum. 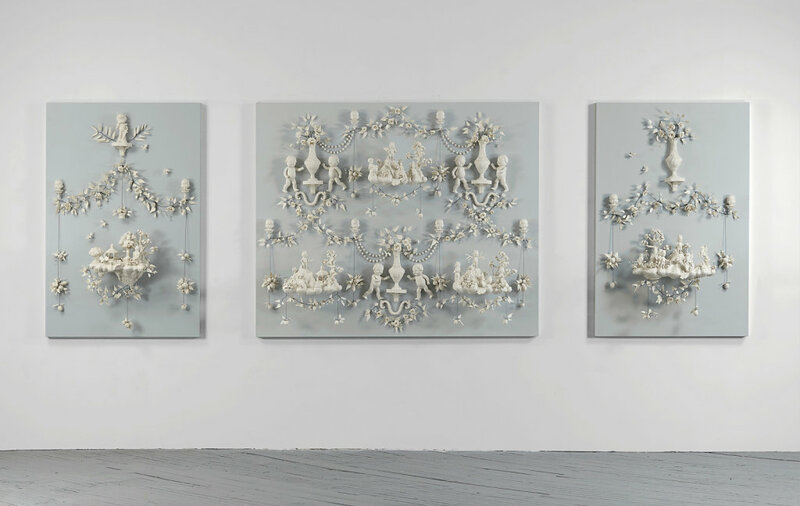 The work brings its source material into three dimensions, but only enough to resemble exquisite fondant icing on a life-sized confection. 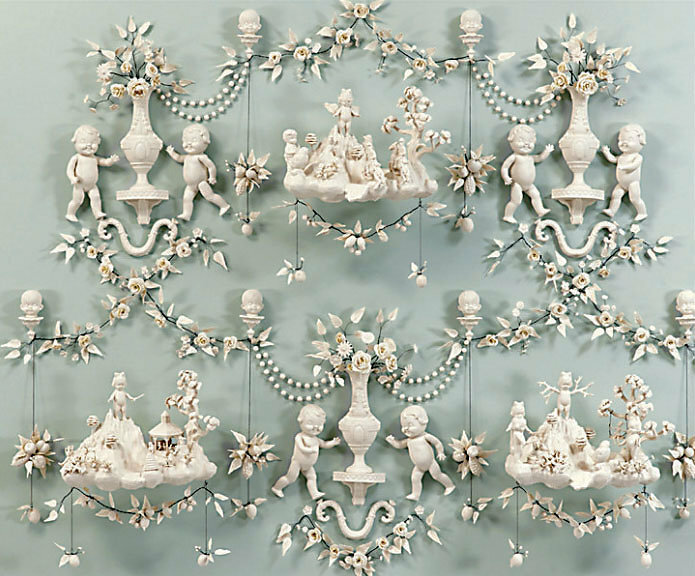 Each of its framed scenes features tiny, devilish porcelain figures that have been cast from small plastic toys and flea market trinkets. These characters are getting up to no good in fine Rococo style, where you might expect to see expressionless cherubs or romanticized milkmaids passing a quiet afternoon. 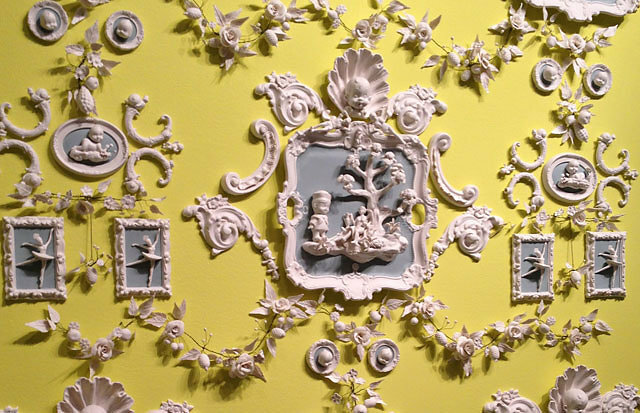 Set against a vivid chartreuse wall, the sleepy Wedgewood blue-and-white color palette brings to mind the wall of a museum period room that’s been given an electric shock." When Beth Katleman pitched her concept to Greenwich House Pottery’s Sarah Archer in 2009, she had no inkling that her career was about to soar into the stratosphere. 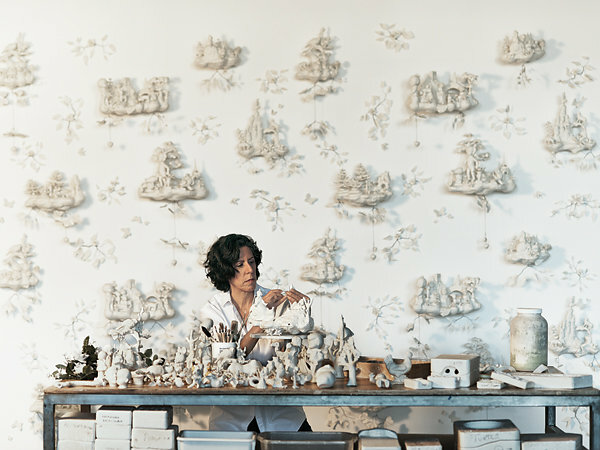 What she did have was a clear image in her head of an ornate, immersive installation composed of multiple Rococo-inspired ceramic islands that, upon closer inspection, would reveal tiny porcelain inhabitants engaged in surprisingly dark behaviors. Fortunately, Katleman got the go-ahead an she spent the next year creating her seminal work, Folly. The rest is history. 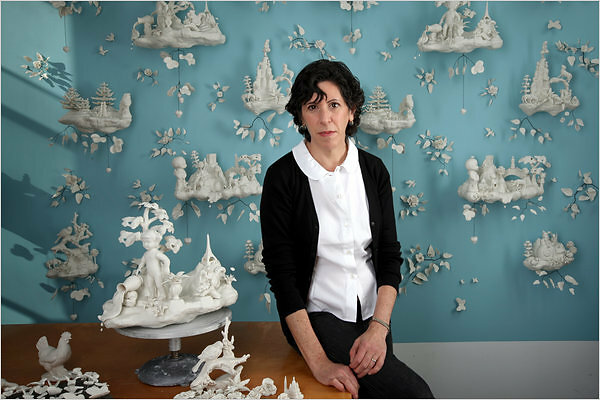 "Near the entrance of the fair, Todd Merrill Studio presents Beth Katleman’s Folly, 2010, a 20-foot-long porcelain wall installation." Beth Katleman is a ceramic artist who plays with dainty forms and techniques, subverting traditional shapes to her own mischievous ends. 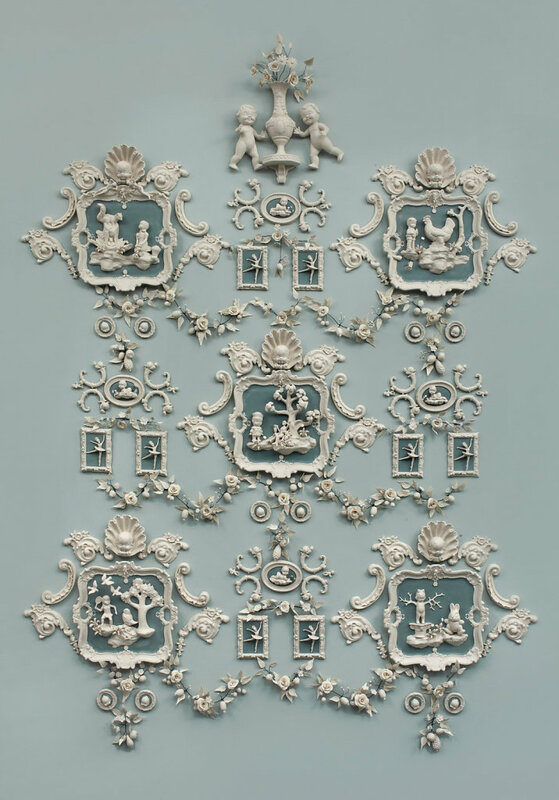 Her delicate earthenware reliefs in wild colors recall the 18th-century porcelain rooms of European royalty — except when you look closely, you might see the Campbell Soup kids brandishing a safety razor among the rococo flowers and vines, or the Pillsbury Doughboy tucked inside an ornate doorway. From afar, Beth Katleman's three-dimensional porcelain "wallpapers" evoke the rococo opulence of 18th-century Versailles—toile de Jouy brought to life. Step closer, though, and the Brooklyn artist's sinister humor begins to peek through, her pastoral gardens revealed to be constellations of flea market kitsch, inhabited by mischievous characters cast from squeaky toys and dismembered figurines. 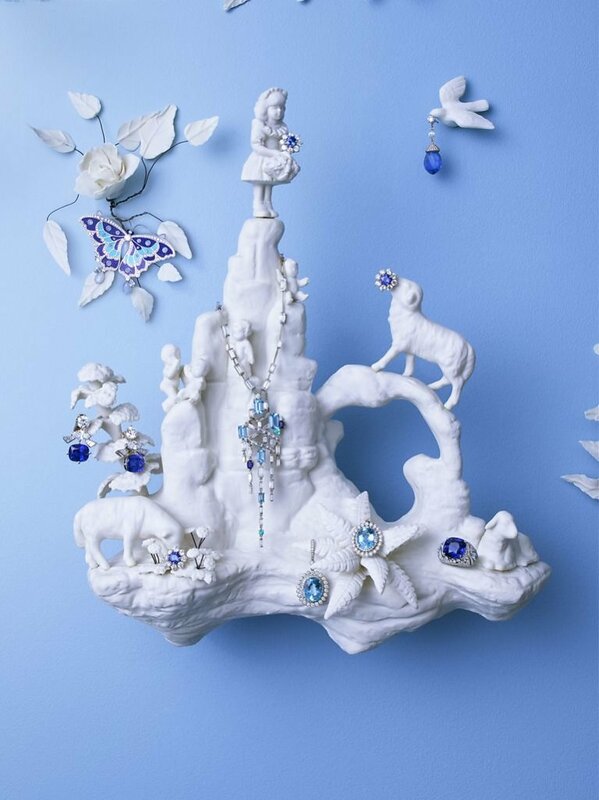 That's the delight—and wit—of Katleman's work, which falls somewhere between critique of and paean to frivolity, and hangs on the walls of Dior's Hong Kong flagship. 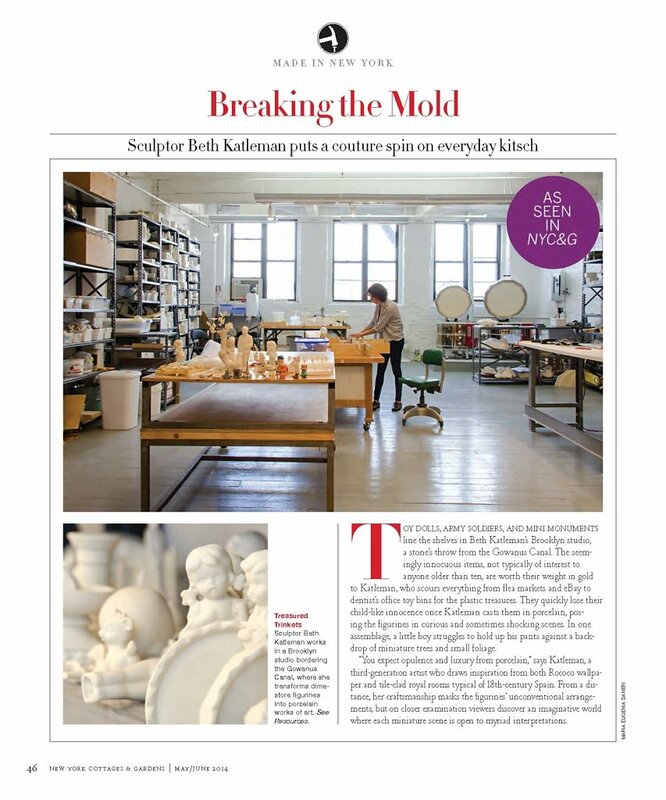 New York sculptor Beth Katleman uses decorative elements that, on their face, appear wholesome, but that hide subversive, often dark messages. 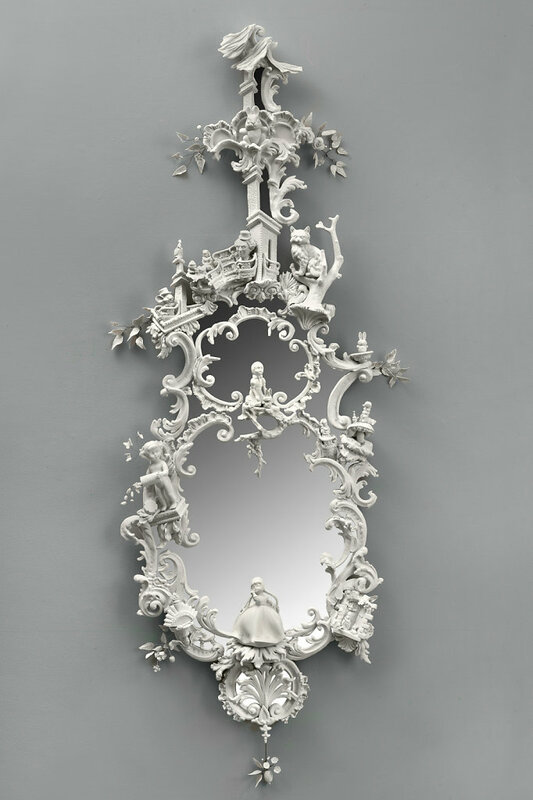 These works use the language of kitsch and rococo, often borrowing objects Katleman rescued from flea markets. Using an art form designed to evoke the dalliances of the wealthy, it’s not surprising to find that one of her treacle-y woodland scenes depict characters oblivious to a small child drowning in a nearby pond. Beth Katleman, Molly Hatch and Shari Mendelson each create highly distinctive bodies of work that have catapulted them into prominence in a very competitive playing field. 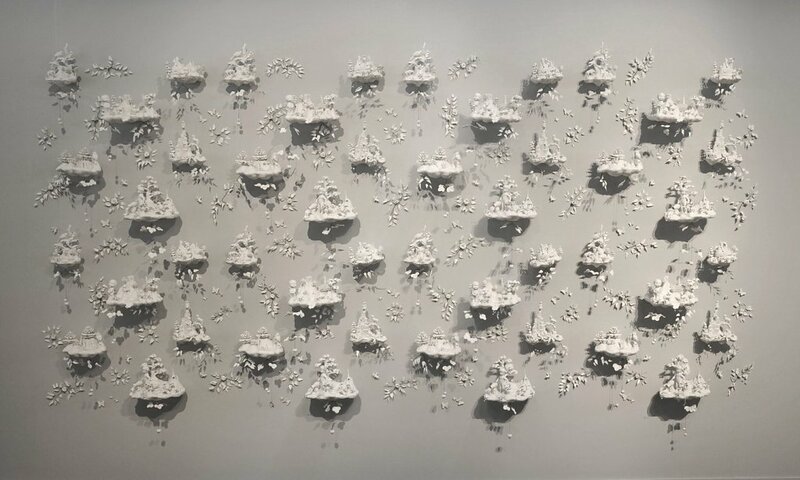 These three artists, though fueled by singularly unique ideas, philosophies and process, share common ground not only in their varying relationships to clay, but also in their inspired connection to the past and their commitment to a labor-intensive artistic practice. Art meets fashion next month at The Metropolitan Museum of Art in New York City, with an opulent exhibition organized by the Anna Wintour Costume Center featuring Chinese paintings, porcelains and film. “China: Through the Looking Glass” explores Eastern imagery and mysticism, May 7 through August 16. As a precursor, we couldn’t help but orient ourselves with imagery of our own, pushing boundaries into sumptuous spaces with inspiring Asian design. Claydon House in Buckinghamshire, England, with its carved pagodas, Chinese fretwork, temples and oriental scrolls, exemplifies chinoiserie at its finest. 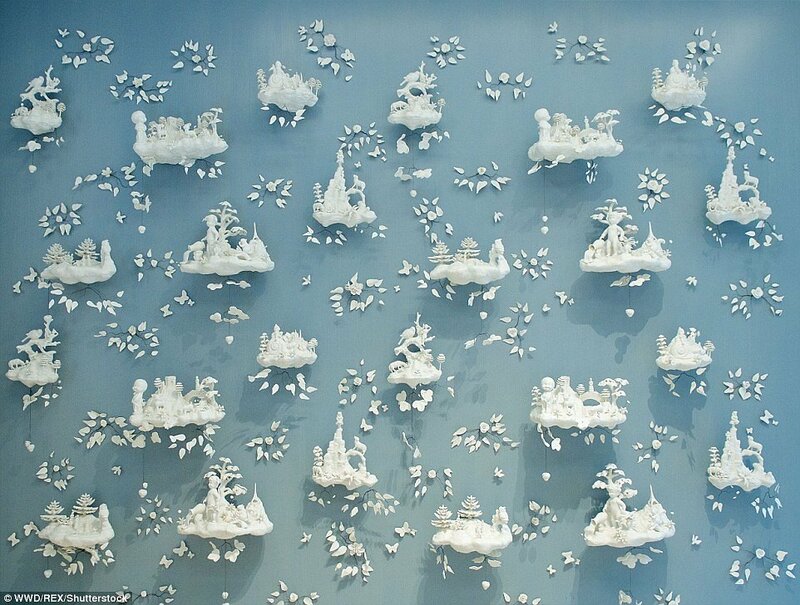 And Beth Katleman’s subtle porcelain installations juxtaposed with spring’s ornate Asian-inspired accessories make us giddy stowaways on an enchanting, albeit slow boat to … you guessed it, China. Several of the 20th century’s seminal movements involved bringing elements of popular mass culture into the realm of high art. Pop artists appropriated magazine advertisements in the ’60s; kitsch artists made balloon dogs in the ’90s. Andy Warhol printed self-consciously garish patterns on rolls of wallpaper. Decades earlier, Picasso used a swath of tawdry floral wallpaper for the background of a collage that otherwise combined elements of elite culture. 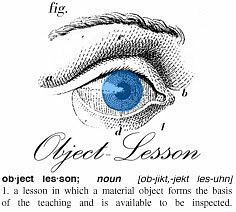 GAMBIER, Ohio — The relationship between humans and mass-produced stuff can get personal, whether the item is a long-wished-for luxury or a small, poorly mass-produced objet d’art — a tchotchke. TOY DOLLS, ARMY SOLDIERS, AND MINI MONUMENTS line the shelves in Beth Katleman’s Brooklyn studio, a stone’s throw from the Gowanus Canal. The seemingly innocuous items, not typically of interest to anyone older than ten, are worth their weight in gold to Katleman, who scours everything from flea markets and eBay to dentist’s office toy bins for the plastic treasures. They quickly lose their child-like innocence once Katleman casts them in porcelain, posing the figurines in curious and sometimes shocking scenes. In one assemblage, a little boy struggles to hold up his pants against a backdrop of miniature trees and small foliage.